Is IFGM one of the best Australian Forex Brokers? We conducted an in-depth review in April 2019 to find out the answer and bring it to you! IFGM is the registered business name of Intelligent Financial Markets Pty Ltd.
IFGM was founded in 2012 in Sydney, Australia, and has progressed to become one of Australia’s top Forex brokers. The brand is driven by specialists of the Forex industry and strives to providing institutional level trading conditions as well as a very high level of quality service to every client. As one of Australia's top online Forex brokerage firms takes IFGM transparency and security extremely serious. IFGM holds an Australian Financial Services Licence (AFSL 426359) and is authorised and regulated by the Australian Securities and Investment Commission (ASIC). All monies received from IFGM's clients are banked, held in trust accounts and dealt with in accordance with the Australian Corporations Act 2001 and the associated regulations. As is the case with all brokers, clients pay a spread on every non-equity CFD and commission on every equity CFD trade. IFGM offers three different account option: Standard, Pro and Islamic (SWAP free). Micro-lot trading (0.01 micro-lots) on the popular MT4 (MetaTrader 4) trading platform is available on all three accounts. The minimum deposit requirement is $200 and a maximum leverage of up to 500:1 is available on their Standard and Islamic account options. The Pro trading account offers leverage of up to 200:1 and a minimum deposit of $1,000 is needed to get started. IFGM’s Standard and Islamic Accounts run without any commission fees. Instead, spreads are variable and marked up above the inter-bank rate received from the liquidity providers. The MetaTrader 4 Pro trading account shows the raw interbank spread received from liquidity providers and a commission fee of 0.003% is applied on the volume of the trade. At this point of time, IFGM focuses exclusively on providing the popular MetaTrader 4 (MT4) trading platform to their clients. All devices and operating systems (Windows, iOS, Android, iPhone and iPad) are supported with the famous MT4. WebTrader is also available which enables all traders to trade without the need of downloading any software or apps. Account managers can further utilize IFGM’s Multi Account Manager (MAM), which is an integrated software tool that allows a single trader (account manager in this case) to execute a block of trades on all accounts operating under one master account. Large orders can be quickly and easily placed in bulk to a virtually unlimited number of accounts. Money managers can choose from a number of different allocation methods, including: Lot Allocation, Percent Allocation, Proportional By Balance, Equity Percent Allocation, Proportional by Equity and Allocation By Equal Risk. IFGM's trading environment is one of the best within the online retail Forex space. They highly focus on executing trades with excellence, applying innovative technologies and capturing new opportunities for their customers to grow. IFGM offers each and every one of their clients premium quality service. Their multilingual support team is available 24/5 during local business hours (AEST). Clients registered with a Live trading account have access to an individual, highly experienced account manager. 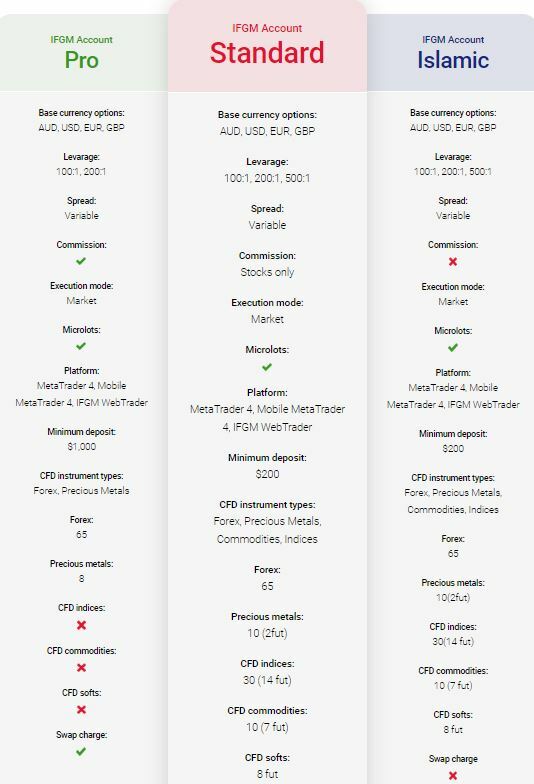 Clients can choose between three distinctly different account types upon sign-up: The Standard MetaTrader 4 account, as well as the Islamic (SWAP free) account options come with no commission charges and offer variable, competitive spreads. The minimum trade size is set to 0.01 lots (micro-lots) and there is a minimum deposit requirement of just $200 for both account types. Over 470 financial instruments in Forex, precious metals, commodities, indices and digital assets can be leveraged as CFDs up to 500:1. The third account option is the Pro account, which offers ultra-low spreads from 0.0 pips and leverage up to 200:1. Pro Account commissions are listed on the Instruments & Conditions section of IFGM's website, but the standard rate is 0.003% per side. Only Forex and metals can be traded with this account type. IFGM offers a total of over 470 different tradable financial instruments such as currency pairs (FX), indices, digital assets, oil, metals and other commodities. IFGM offers leverage of up to 500:1 on their Standard and Islamic account options and 200:1 on the Pro account. Four different funding currencies (AUD, USD, EUR & GBP), micro-lot trading starting from 0.01 lots and ultra-low spreads from 0.0 pips are accessible. The minimum deposit requirement is set to $200 for the Standard and Islamic account types and $1,000 for Pro account holders. Commissions for an IFGM MetaTrader 4 Pro account are set at 0.003% per side. High standard in customer service with a dedicated, professional account management team. Ultra-low spreads from 0.0 pips in an institutional grade trading environment. MT4 for all common devices and operating systems. High leverage up to 500:1 on Standard and Islamic accounts and up to 200:1 on Pro accounts. Most trading types, such as Expert Advisors (EAs), scalping and hedging are allowed. Prestige Client Club offering the best trading conditions for serious traders. MAM and PAMM platforms for money managers. Most trading styles, such as Expert Advisors (EAs), scalping and hedging are allowed. IFGM is a rising star within the online Forex trading space. They can already be considered as one of Australia's leading and most experienced Forex brokers, offering an amazing, professional trading experience with high leverage, very tight spreads, exclusive offers and excellent customer service. | where is IFGM located? 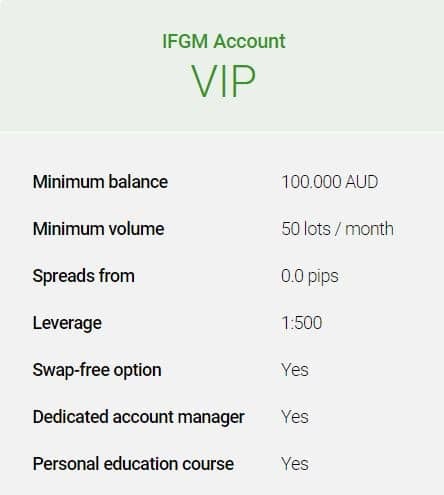 IFGM is an Australian based (Sydney), owned, and ASIC regulated Forex broker. | how to fund an IFGM trading account? Yes. IFGM is authorised and regulated by the Australian Securities & Investments Commission (ASIC), AFSL number 426359. | is IFGM FCA regulated? Yes, absolutely! IFGM complies with strict regulations and is licensed and regulated by the Australian Securities and Investments Commission (ASIC). Clients’ funds are held save and securely in separated, segregated trust accounts. | does IFGM accept clients from Canada? Yes, clients from Canada are welcome, however applications from Canadian residents of Ontario cannot be accepted. IC Markets is another Australian based and ASIC regulated Forex broker with a strong offering and excellent trading conditions.